Quick initial assessment; The fuze looks simple and very straight forward so no need to talk about that. The light red cord (3 pieces) looks like it may be Det Cord. It appears that the silver end portion of the three pieces of Det Cord may contain boosters (similar to the Det Cord/Booster assemblies contained in the M183 Satchel Charge) or the Det Cord has been sensitized by attaching non-electric blasting caps. These silver boosters/blasting caps are contained in the anvil/manifold portion of the fuze. I would suspect that the other end of these pieces of Det Cord that are imbedded somewhere inside the barrel bombs main HE filler also have boosters or have been sensitized. You also may find a portion of these Det Cord leads that have been tightly knotted and imbedded in the barrel bomb HE filler section. This knotted section of Det Cord acts as a booster for the main charge. In actual fact, an airburst can help the effectiveness of this size of munition against area targets, but you'd be hard put to it to guarantee the right height with a wick fuse. Needs to be dropped from a great height, if the aircraft is not a fast mover. 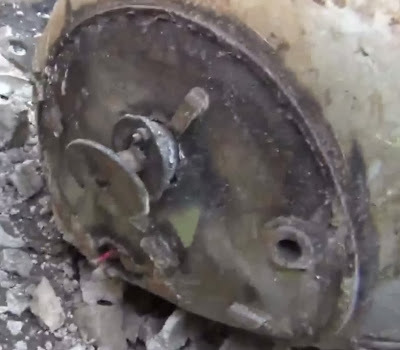 Medawar, This barrel bomb may very well have multiple nose fuzes since it appears to have three potential fuze wells in its nose plate assembly. I have also listed some very basics visual indicator to help determine if det cord and/or time/safety fuse is being used. 1. Detonating Cord; The central core color of exposed/cut ends of det cord will have a white or off white color. Typically det cord branch lines will be connected together with tape, knots, or clips/connectors. If det cord is to be used as a booster to set of a main charge it will have booster/s attached on its exposed end/s or it will be sensitized by having non-electric blasting cap/s attached on its exposed end/s or it will be tightly knotted, a det cord ULI knot is a good example of this type application. 2. Time/Safety Fuse; The central core color of the exposed/cut ends of time/safety fuse will be a shade of black. Blocks of what might be TNT/ammonium nitrate? (commercial amatol, basically) as boosters for a main charge of IRA-standard CO-OP mix. Similar diameter to a 4,000lb HC, though maybe not as long. I wish they would take the men handling the fusing materials further away from the man shoveling the main charge out of the ruptured casing! Here is another Barrel Bomb video I found. This one shows what appears to be det cord placed in the center of the Barrel Bombs HE filler. It looks like they used a somewhat modified det cord ULI knot. 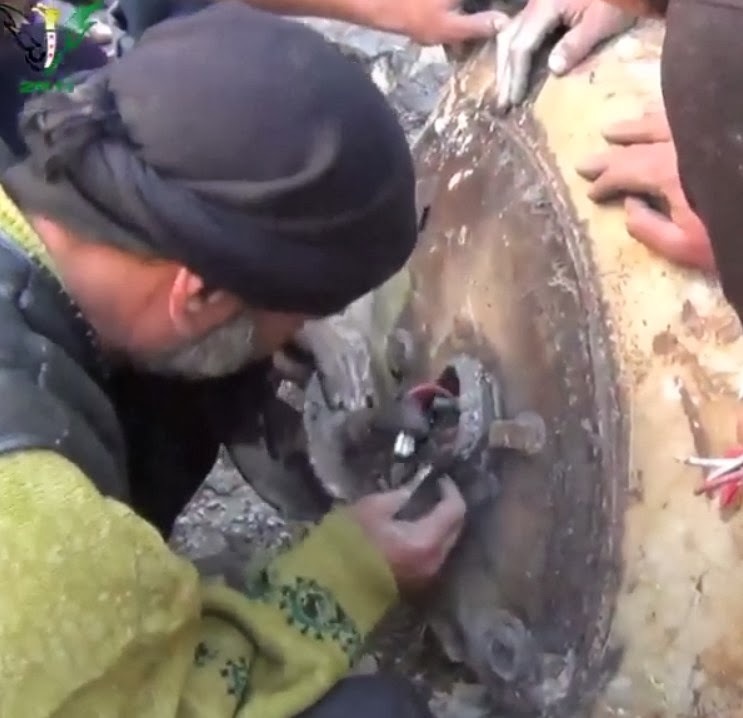 This modified ULI knotted section of det cord appears to be the booster and is designed to detonate the Barrel Bombs HE filler. Also, you can see lots of white sticky/powdery (?) material coating the det cord ULI knot. This white stuff may be residue from an additional booster charge (plastic explosive or something similar). If this is the case then the ULI knotted section of det cord would have been imbedded inside this other type of white colored explosive. Thanks, that's very interesting, there's clearly an already increasing body of evidence that these larger DIY barrel bombs are being used. Humor; Based on all these videos of dud Barrel Bombs, I now can see where the FSA might be getting a good quantity of their raw high explosives from. A couple more videos that show some familiar explosive materials. They speak for themselves so I wont say much. 1. The first video shows the bulk containers full of (TNT) with labels. Also shows the red det cord, electric detonators, and firing devices. 2. 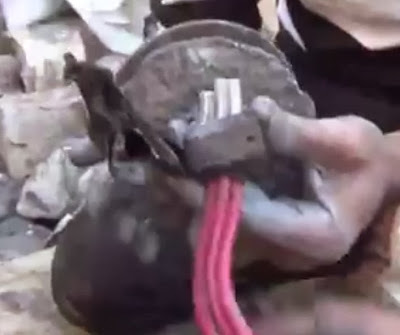 The second video is a VBIED and shows the same bulk explosives and some red ULI knotted det cord, etc. Your video shows a new type of UMLACA at 0:11. Charles, that looks like a round for the Hell Cannon, which I'm sure you are familiar with. If it's a hell cannon round, it's a brief but very clear shot which might tell us more about how it's made. Looks as if the warhead was a propane cannister in another life. Minimum safe release height for a 4,000lb HC was 6,000'. I had to refer to the 1959 Chambers Encyclopedia for the blast area, which was 24,000 square yards for the 4,000lb HC. Filling was 3,000lb of Amatol. I would think that for the barrel bomb to have genuinely safe fuse, it would need to have a properly-engineered and tested release rack capable of all the coordinated actions. Which would be more work than the bomb, though it may appear in a few months time as it's an obvious next step. The 4,000lb HC is also notable for flying straightest when fitted with a slightly domed nose spoiler and drum tail: a conical nose spoiler, although thought more streamlined, was not stable. This is may refer us back to the big rockets and their aerodynamics, discussed recently. Being stable helps range for a rocket as it keeps the thrust in the right direction as well as drag being more for something traveling sideways. I think this means a similar sized barrel bomb would have a blast radius of ninety or so yards, though debris coming out of the area might be lethal very far away. right up until the bearded man hits it with his sledgehammer. In that case, not very plastic at all. Note that there is another munition of some kind at the back of the garage. Backing away from the man with the hammer would have done no good as he was bashing the booster charge out next to pile of powdered explosive. Bless. That's a truck bomb they are sitting on! A huge one in a strong steel box. Like Liddel's main charge in HMS Cambeltown for operation Chariot. I think the big steel box is actually the water tank for what looks like a small fire engine. This suggests a variation on the "two bomb" tactic where one small bomb attracts emergency responders only to be killed by a bigger one: small bomb creates fire, "fire engine" drives into secured area to put out the fire: bang! The men who made this video are shocked and offended. Are the black boxes associated with the detcord possibly electronic timers? I think the fire engine bomb might have been a couple of tons TNT; a bit hard to say. Medawar, yes the black box/s are associated with the det cord. There is one other key explosive item there (electric detonator) but you can't see it. Another clue, note the location of the black box/s. You will have to figure the rest of this one out on your own, sorry. Also, when time fuse is knotted or squeezed/pinched the powder inside is compressed and yes it does burn faster. Also, when time fuse is used under water the same thing happens. As the depth increases so does the external pressure on the time fuse and it will burn significantly faster the deeper it goes ( I have lots and lots of experience in these areas). Additionally, don't confuse the ULI knotted det cord with time fuse, as seen in most of these videos. A ULI knot (or other det cord knots) is a deliberate attempt to turn a section of det cord into a booster and it shows that these folks have some level of basic demo training. There are two hatches, and there seems to have been detcord and black boxes in both. Fill is a foot or so below the hatch at one point, deeper at the other. I think the mobiles phones that appear in the man's hand later (with masking tape labels presumably with the number to call) must have lived on the outside of the steel tank, perhaps with an earphone cable going to the black boxes inside the tank? Medawar, the black looking explosive filler in the one Barrel Bomb may be as simple as; a mixture of Potassium Nitrate, Charcoal, with an added touch of Sulfur. Also, TNT and most other raw high explosives will start to darken up when exposed to the open environment/elements. The longer the explosives are exposed to the elements the darker they will get. Additionally, this exposure will cause the explosives, if in powdered form, to start to stick together/chunk up. Cast explosives (like TNT blocks) or pressed explosives will also darken up and become brittle. If your take a block of TNT that has been out in the elements for awhile and break a piece off the surface of the block, the unexposed TNT will be a much lighter color then the outer exposed TNT surface. I've tried to summon help from Richard Silverstein's readers who might understand all that's being SAID in these videos. May not happen till after the Sabbath, of course. It doesn't drop very far before it explodes, which may be why the camera survived directly underneath! Do we know if the cameraman made it, or the helicopter? Nicely illustrates the essential problem with miner's slow fuse and airdropped munitions. There was a Hornblower short story about blowing open a sunken wreck with a barrel of gunpowder: this is the equivalent of the "flying fuse" which Hornblower and his men are trying to avoid using. As I understood it, a flying fuse is a length of cannon fuse in a rubber pipe, which can burn faster or slower if the fuse is twisted loose or twisted tight. I'm not sure if there's anything on the internet about this, but I've read printed articles in pre-internet days about slow fuse becoming really quite fast fuse if it gets untwisted. The first barrel bombs were used by the insurgents, they were copied by the Syrian Arab Army, so instead of lobbing them off a building, the innovation was applied to helicopters. Building-launched barrel bombs must have been smaller than these, as these are approaching the power of the IRA bomb which shunted the Baltic Exchange building off its foundations. Since few buildings in Syria are as strong as that building was, this would be a suicide bombing. Not impossible, I know, but not sustainable either. Greig, I assume you have a source for this information? My chat was about August 2012. I can't remember the specifics, Aleppo, it was propane bottles, from a roof or window, they were short lit fused, like in the movies. The SAA understand the Grozny thing, it is just not easy to pull it together, they're short of trained soldiers. The Syrian Arab Army stopped doing SWAT stuff on buildings a long time ago, they try to cover windows, and rooftops, as they hug walls and doorways. The pilots often do their own scouting, so it is not as sensible as it could be. Precisely. These barrel bombs contain up to three quarters of a ton of TNT, the Baltic Exchange bomb was a larger quantity of a weaker explosive. Somehow "throwing" (toppling is more likely) such a bomb off the top of a building guarantees that building will collapse. A propane bottle of explosive has a fraction of the power of one of these barrel bombs. The whole point of the article was that these are very big barrel bombs. 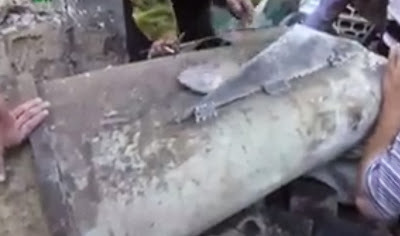 The point emerging from the videos and comments is that the explosive materials used in their construction are indeed identical to those used in a truck bomb, found in the water tank of what appears to be a fire engine or water truck. Your link pertinently puts the explosive content of a metre-long propane cylinder at 70KG, which is about a tenth of these barrel bombs. Even that would be a difficult and dangerous thing to chuck off a building, so I presume the rebels used smaller cylinders in the main. 20Kg would probably be enough to destroy a tank if it exploded on the thin armour of the turret roof or engine deck. It's also worth noting that the Lynx helicopter "shot down" by the barrack-buster was hovering over a predictable point (the helipad) at the time, and that the fuse of the projectile appears to have set it off on the ground afterwards: the damage was all done by the kinetic energy of the cylinder and the stored energy in the spinning tail rotor system. The crew survived and they would not have done had the cylinder exploded on impact with the Lynx. The element of luck involved, even with a hovering target, was pretty considerable and more often they missed by a long way. Which is why local nationalist politicians were so angry about the action.